Student union chief electoral officer Oliver Cohen capped off a strenuous mandate on Monday by delivering his set of recommendations to the union, suggesting amongst other things that the incoming executive extend the campaign period and amend the standing regulations. 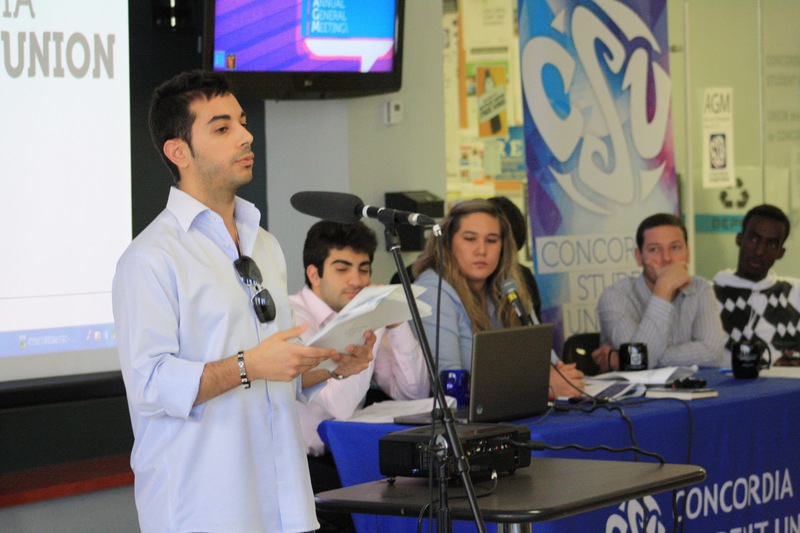 Cohen outlined the recommendations, which make up a section of his final report to the CSU, to around 40 students at Monday’s annual general meeting on the 7th floor of the Hall building. He took to the microphone for a span of a few minutes to note that the 90-page report would be available online on the union’s website. He then made for the exit, but was coaxed back to elaborate further on its contents. Cohen also suggested the union go over the Judicial Board’s code of procedures in relation to the appeals process. “It should probably be something along the lines of a rotational committee where in the process of appeal a new board is summoned,” he said. The CEO stood by his decision to disqualify the Your Concordia and Action slates, despite seeing that decision overturned by the Judicial Board. “I’m not going to sit here and tell you guys that the integrity of the elections was maintained, because it was not,” he said. The outgoing executive also made their end-of-year reports to their constituency. In his updated budget, VP finance Ramy Khoriaty noted the expected $37,000 end-of-year surplus was lower than the union had originally projected in their budget. The added expenses mostly came from the unexpected cost of reimbursing ASFA for their tickets for the Youth in Action Montreal conference, which they had previously been selling for $20 each before the CSU decided to give them away, he said. That move made a $11,000 dent in the union’s pocket book. That surplus had further been eaten away by Wednesday’s regular council meeting, when Khoriaty noted that a $20,000 invoice from the Canadian Federation of Students brought the overall expected surplus to approximately $16,000. Khoriaty’s suggestion to re-appoint Deloitte, the firm hired to audit the union’s previous fiscal year was challenged by incoming VP finance Jordan Lindsay, who motioned for an open call to tender instead. “It’s not to say that Deloitte won’t do a good job, we’d just like to have the opportunity to look at other options,” he said. While Lindsay said he knew Deloitte was one of the more expensive auditing firms, he admitted he did not know exactly how much they charged. The motion stipulated that Lindsay, Khoriaty and director of finance Michele Dumais would prepare a list of possible auditors for submission at the June 8 council meeting.